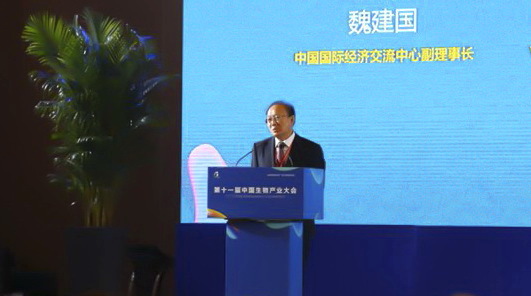 On May 25, 2018, Wei Jianguo, Vice Chairman of China Center for International Economic Exchanges, Deputy Director of the CCIEE Executive Board, and former Vice Minister of Commerce, addressed the opening ceremony of the 11th China Bio-industry Conference and the 3rd China Optics Valley International Life and Health Industry Expo in Wuhan. Wei Jianguo reviewed the development of China’s reform and opening up, pointing out that under the leadership of the Belt and Road initiative, the opening up of China has changed from the initial trade and economic opening up to a more comprehensive opening up, covering education, culture, science and technology. Furthermore, the initiative has accelerated the process of introducing China’s technology, equipment and brand to other countries. He said that the Alliance for Life Science Promotion established under the Belt and Road initiative will inevitably help leading institutions like BGI to expand and deepen pragmatic cooperation and further enrich the Belt and Road cooperation. Lastly, he hopes that all relevant parties and BGI can adhere to the Silk Road spirit of peaceful cooperation, openness, inclusiveness, mutual learning and benefits, start to build platforms that benefit all parties and commit themselves to build market-oriented, international and sustainable cooperation mechanism and development model. On behalf of CCIEE, Wei Jianguo initiated the establishment of the Belt and Road Alliance for Life Science Promotion, and signed the Belt and Road Cooperation Consensus on Alliance for the Promotion of Life Science with other organizations such as BGI, the Ministry of Economic Affairs of Latvia, the Ministry of Science and Technology of Laos, the Institute of Saline and Alkali Research of the UAE, Wuhan East Lake New Technology Development Zone, and Shenzhen International Exchange and Cooperation Foundation, Shenzhen Genetic Research Alliance and the China National Gene Bank.